The nutrition of school lunches — or lack thereof — is a hotly contested debate as childhood obesity rates have risen in the United States. A part of this debate focuses on the length of school lunch times, whether school lunch times should be extended to give students more time to eat — and eat healthily. Both pros and cons exist in the debate over longer school lunches. Tossing some pizza in the oven and tater tots in the deep fryer doesn't take long. However, making healthy lunches is more time consuming for cafeteria staff and students. For example, Greenville, S.C., schools installed salad bars in their cafeterias, a healthy option, but one that takes longer since students have to make their salads and then eat them, as reported by North Carolina's WSPA 7. A longer school lunch time allows students to enjoy these healthier menu items. Adding to the school lunch time can add to the school day if administrators are not willing to cut time in other ways. A longer school day leaves students less time after school for physical activity, which is another important component in keeping students at a healthy weight. In addition, a longer school day might lead to burnout among students and, ultimately, make that extra lunch time simply not worth it. The Journal of Child Nutrition and Management, in a spring 2002 article by Martha T. Conklin and other researchers, reported that kindergartners through 12th-grade students took seven to 10 minutes to eat their lunches — not much time. With a longer lunch day, students can have more time to eat slowly and recognize signs of fullness, which do not develop until 20 minutes after eating. Students can also take advantage of important socialization time with a longer lunch break. Extending the school lunch time, without extending the school day, means that academics will take a hit. Students will spend more time in the cafeteria and less time in the classroom. While this might be beneficial for their social skills, it will not help them in their academics. Teachers will have to fit their current lesson plans into shorter classes, which can be challenging and make covering material difficult. Other pros and cons exist in the school lunch debate. 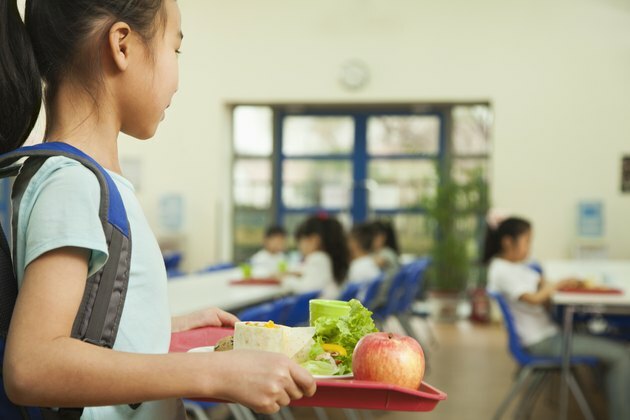 If a longer lunch allows high school students to leave campus, they might opt for unhealthy fast-food options; on the other hand, this extended time might allow them to seek out healthier dishes than those available in the cafeteria. Those against extended lunches might argue that budget cuts make an extended lunch requiring more skilled cooks and more expensive menu items unrealistic. Proponents might cite the benefit of an extended break for students from the rigors of schoolwork. The Journal of Child Nutrition &amp; Management; How Long Does it Take Students to Eat Lunch? A Summary of Three Studies; Martha T. Conklin, et al.